our line. Am on Express East, which has a good number of through passengers; but all proper persons, including Mr. Halstead, of the Commercial, and several other Editors of the West. Two of the detective officers are returning on our train. I arranged fully at Cumberland last night to have the trains in both directions attended by additional men to-morrow as understood. 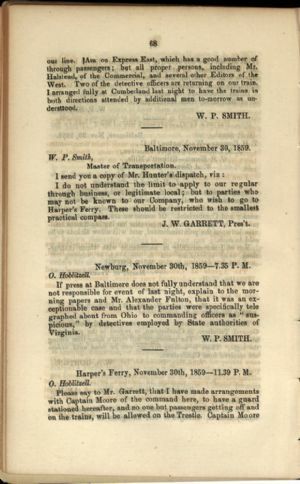 I do not understand the limit to apply to our regular through business, or legitimate local; but to parties who may not be known to our Company, who wish to go to Harper's Ferry. These should be restricted to the smallest practical compass. Newburg, November 30th, 1859—7.35 P. M.
If press at Baltimore does not fully understand that we are not responsible for event of last night, explain to the morning papers and Mr. Alexander Fulton, that it was an exceptionable case and that the parties were specifically telegraphed about from Ohio to commanding officers as "suspicious," by detectives employed by State authorities of Virginia. Harper's Ferry, November 30th, 1859—11.39 P. M.